In 1765, Johann Christian Bach and Carl Friedrich Abel founded the Bach-Abel Concerts, the first public subscription concert series in London. Carl Friedrich Abel (1723–1787), a German composer and viola da gamba player who settled in London in 1759, had studied with Johann Christian’s father Johann Sebastian Bach in Leipzig. Bach and Abel continued their collaboration through 1781, offering regular concerts of instrumental and vocal works composed and performed by prominent musicians of England and Europe. This version of an excerpt from Bach’s cantata Rinaldo ed Armida was published in English translation and with the original orchestral accompaniment adapted for a small ensemble of chamber musicians. 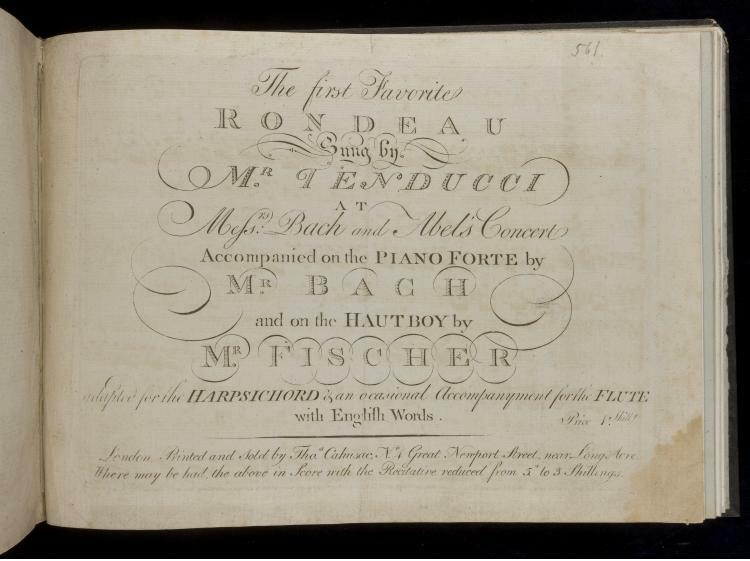 The title page refers to a performance by Bach, Abel, and two colleagues. Giusto Ferdinando Tenducci (1735–1790), Italian castrato and composer, arrived in London in 1758. He sang Italian opera at the King’s Theatre, appearing in the first performance of Bach’s Adriano in Siria. Johann Christian Fischer (1733–1800), German oboist and composer, was active in London from 1768. Fischer served as a chamber musician to Queen Charlotte, as did Bach and Abel. This music was later bound in one of several volumes in the Archive titled “Englische Gesänge,” or “English songs.” In this volume, Bach’s music is gathered alongside vernacular English works, such as Holy, holy, holy, the classic English hymn by Reginald Heber. These albums reveal the tremendous breadth and vibrancy of popular musical culture in England in the late eighteenth and early nineteenth century—and the equal enthusiasm for English music, over decades, of members of the Hanover royal family.